There is little doubt that many of the operational changes coming the way of the mortgage industry employ data to improve decision making, re-write business processes, and support decision making. Whether it is in property risk and valuations, or underwriting, the arrival of the so-called digital age has heralded not just better data but improved systems and programming to support the complex decisions IT is now making or managing for us. If you are in any doubt that big data is here you need only look to our daily lives to see how the information we want, in real-time, is now seamlessly delivered to us as consumers. To put the whole impact of data and its potential for every industry in context, it’s worth remembering that 500 times more data was generated in 2012 compared to the total volume that was produced from the dawn of time right up until a decade ago. In 2015 the amount of data we produced was roughly three times that of 2012. By any standards, that is a lot of data. 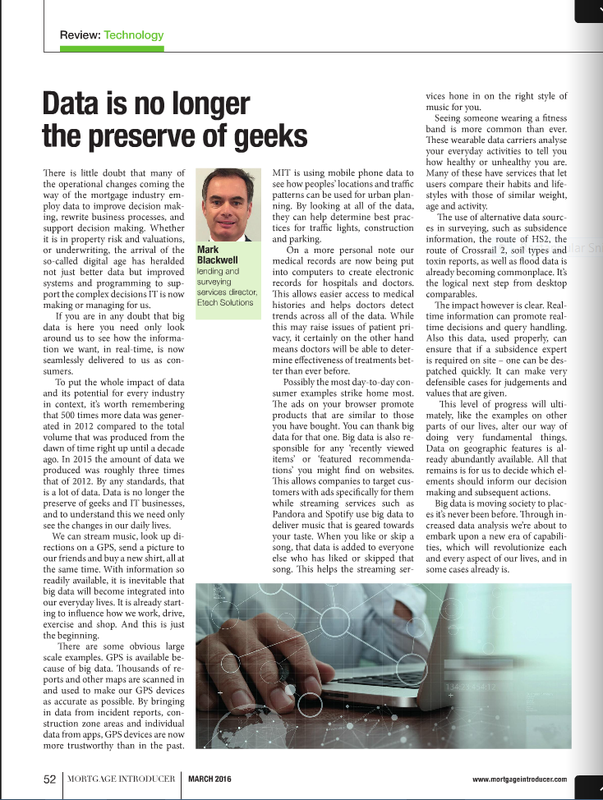 Data is no longer the preserve of geeks and IT businesses, and to understand this we need only see the changes in our own day to day living. We can stream music, look up directions on a GPS, send a picture to our friends and buy a new shirt, all at the same time. With information so readily available, it is inevitable that big data will become integrated into our everyday lives. It is already starting to influence how we work, drive, exercise and shop. And this is just the beginning. There are some obvious large scale examples. GPS is available because of big data. Thousands of reports and other maps are scanned in and used to make our GPS devices as accurate as possible. By bringing in data from incident reports, construction zone areas and individual data from apps, GPS devices are now more trustworthy than in the past. MIT is using mobile phone data to see how peoples’ locations and traffic patterns can be used for urban planning. By looking at all of the data, they can help determine best practices for traffic lights, construction and parking. On a more personal note our medical records are now being put into computers to create electronic records for hospitals and doctors. This allows easier access to medical histories and helps doctors detect trends across all of the data. While this may raise issues of patient privacy, it certainly on the other hand means doctors will be able to determine effectiveness of treatments better than ever before. Possibly the most day-to-day consumer examples strike home most. The ads on your browser promote products that are similar to those you have bought. You can thank big data for that one. Big data is also responsible for any “Recently viewed items” or “Featured recommendations” you might find on websites. This allows companies to target customers with ads specifically for them while streaming services such as Pandora and Spotify use big data to deliver music that is geared towards your taste. When you like or skip a song, that data is added to everyone else who has liked or skipped that song. This helps the streaming services hone in on the right style of music for you. Seeing someone wearing a fitness band is more common than ever. These wearable data carriers analyze your everyday activities to tell you how healthy or unhealthy you are. Many of these have services that let users compare their habits and lifestyles with those of similar weight, age and activity. The use of alternative data sources in surveying, such as subsidence information, the route of HS2, the route of Crossrail 2, soil types and toxin reports, as well as flood data is already becoming commonplace. It’s the logical next step from desk-top comparables. The impact however is clear. Real-time information can promote real-time decisions and query handling. Also this data, used properly, can ensure that if a subsidence expert is required on site – one can be despatched quickly. It can make very defensible cases for judgements and values that are given. This level of progress will ultimately, like the examples on other parts of our lives, alter our way of doing very fundamental things. Data on geographic features is already abundantly available. All that remains is for us to decide which elements should inform our decision making and subsequent actions. Big Data is moving society to places it’s never been before. Through increased data analysis we’re about to embark upon a new era of capabilities, which will revolutionize each and every aspect of our lives, and in some cases already is.